Now a days Logical Puzzles are asked in the interviews. If you can going for an interview in a software development company then it is definite that some logical puzzles will be asked from you. Sometime Quick Interview Questions will be asked in the interview. However here I am posting some of the tough interview questions being asked in many of companies like Flipkart, Google, Microsoft, Amazon, Infosys etc. Anyway here are I am putting some of the tough interview questions which are being asked as screening of many IT companies. I will keep adding new questions in the same thread. Answers to these tough interview questions are given at the end of this post. To avoid any spoilers, I have hidden the answers. Do select the text between numbers to see the solution of a specific interview question. As I mentioned that these are the interview questions being asked in Information Technology(IT) companies. In typical IT companies different people even if working at the same level/designation may have different salaries. So it is not considered good to discuss one's salary with the another person. First interview question is based upon salary. 1. Four employees of a Software company are sitting together and they want to find out there average salary anyone knowing any other person's salary. How this can be done? 2. There are seven sisters in a home in a remote village where there is no electricity or any gadget. what is Sister-7 doing ? Developing software requires lot of logical thinking as well as Mathematically knowledge. Following question is being asked in Software development companies like Microsoft or Google where Math skills are also required along with logical thinking. Sometime one can logical reach different answer depending upon how you read the statement of the question. 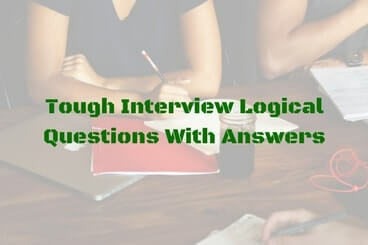 Here is one interview question which not only can be answered differently but also be explained logical. I have explained both the answers for this interview question. 4. Mr. Manish wishes to cross a the Thar desert. It requires 6 days to cross Thar desert. One man can only carry enough food and water for 4 days. What is the fewest number of other men required to help carry enough food for Mr. Manish to cross ? Lets try to find the general solution to the above problem. 5. What about if it takes 18 days to cross the dessert. You can only have 12 days of food supply. You can take maximum two people along you to help you to cross the desert. Below is hidden answers of these Brain Teasers. Select the text between the numbers to lookout at the corresponding answer. 1. If first time one comes across this puzzle, it looks tough interview question. However if you thinking logical you can find average salary of four employees without anyone knowing each other's salary. This solution is not limited to four people but can be applied to N people who want to find out their average salary. To do this 1st person will add a random number to his/her salary and pass the total to the next person. The second person will add it's own random number and then pass it to the 3rd person and so on. Last person will pass the total after adding his/her own random number to the 1st Person. Now they will do the reverse process by subtracting their random numbers from the total and then passing it to the next person. When everyone has subtracted its own numbers the total represents the sum of their salaries which when divided by N will give their average salary. 2. At the first glance this question looks like how come we can know that is the Sister-7 doing? However if one reads that they are in the remote village where there is no electricity or gadget then immediate logical though comes that there has to be one activity which cannot be performed by a single person. So the Sister-7 is playing chess with Sister-3. 3. Step [e. Divide both sides by (x-y)] is wrong here. As x=y, so x-y = 0; Dividing anything by 0 leads to infinity which voids the equation and leads to wrong result. 4. First answer which most of the people will conclude logical is TWO people. All three start with 12 days of food. After 1st day 3 days food is consumed and 1 person returns back with 1 day food and remaining two people will start with 8 days food. Next day 2 days food is consumed and second person goes back with 2 days food and Manish goes to cross the Thar desert with 4 days of food. Another answer to this problem can be ZERO people as puzzle statement does not mention that Manish has to take minimum days possible to cross the Thar desert. Mr. Manish alone can carry food out into the desert and leave it, then return home for more food, then go out further and leave it, etc., until he has enough stored to complete the journey. Each day, Manish leaves home with 4 days' worth. He starts the ordeal by taking 2 days' worth of food out to the 1/6th point and returns home, since he uses 1 day's worth to get there and 1 to get back. Next, he does the same thing, now having 4 days' worth stored there. On the next trip out, he ends with 7 days' worth there, since he doesn't return home again. Then he uses 4 of the 7 to store 2 at the 2/6th point and return to the 1/6th point, where he had left 3. Lastly, he takes those to the 2/6th point, giving him the 4 he needs to go 4 days to finish the desert crossing. 5. To solve this kind of problem one has to start from the end. As at end one need to have 12 days food then move backward with your helper. I will leave it to readers to solve this puzzle and comment their answers. Here is answer to 15th Brain Teaser Question of post titled "Out of Box Thinking Fun Brain Teasers with answers to Challenge your Mind ". The answer to this Riddle is COCONUT. If you feel hungry a Coconut has a part that you can eat. If you feel thirsty a coconut has its juice contents which has high ions for better re-hydration. When you feel cold there is a part of a coconut that is good for burning and it turns into a charred coal when totally burnt.